namely editor Darryl Isherwood and correspondent extraordinare Max “Mad Max” Pizarro. Darryl not only posted on his site the Veterans Day blog post I wrote about my father’s link with the Battleship New Jersey (and a tenuous but appreciated association I share with him with the great warship), but then with input from Max, put him in their “Winners” column for the week. Needless to say, it made a humble World War II Navy vet’s day and meant the world to him not just for himself but for the recognition such an act brings to all our veterans who’ve proudly served, and continue to serve, this great nation. So a strong salute and a tip of the cap to Darryl, Max and Politickernj.com for a class act by a standup group. I thank you again here publicly to acknowledge that act and share it with my blog’s readers. After writing the blog post on Missy Rebovich and her dad, David, I received an email from Rider University’s communications director, Dan Higgins. Dan had dug into his files and sent a few photos along with his note. I’m posting those but I also wanted to share with the blog’s readers (with his blessings) the note Dan sent because of its candor and what it says about Missy. As I said after the piece that aired, David would be proud. Her Mom, Jane O’Connor, surviving grandparents and the rest of her support team are, too, and rightly so. Missy with Ben Dworkin, director of the institute named for her father, David. 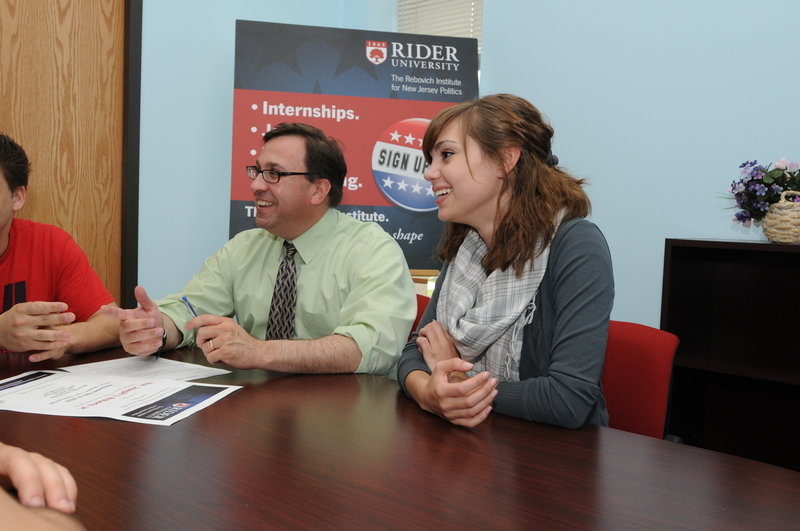 Missy Rebovich helps Rider University President Mordechai Rozanski unveil the re-named Rebovich Institute for New Jersey Politics back in November, 2008. When I was first interviewing for this job, one of the attractions was that I was going to have the opportunity to work with David Rebovich and the Institute for New Jersey Politics. I had watched him on NJN and read his insights in all of the New Jersey papers and politickernj.com for years. 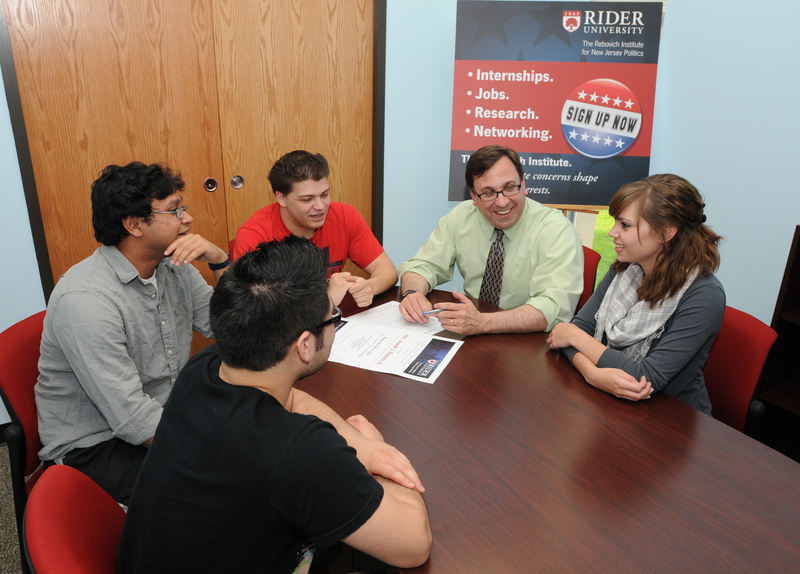 We had a couple of meetings in my first two months on the job and were making plans for future programs at Rider. Then, I received the phone call about his heart attack. The entire Rider community was in shock. But somehow, having Missy as part of our Rider family helped all of us heal. The announcement to keep the Institute going and to rename it in honor of her father was made at the 2008 Commencement ceremony, and the formal dedication was held in the fall with Missy and President Rozanski unveiling the new Rebovich Institute sign. Missy and I served together on the hiring committee to find a new director, and I know it has been a great help to Ben Dworkin that Missy not only endorsed his selection, but in fact advocated for it. As I am sure you found during your interview, she is quite an impressive young lady and has a great future ahead of her. Thanks again for sharing your blog with me. I have posted it on our Facebook page and hope that all of our fans take a look at it. It was new to me, but as some dear readers surely already know, when you write a blog there also comes along with it some stats you can peek at; at least here at WordPress. Things like what search terms were used to get to the blog, how many times individual posts are read and which links have been clicked on. By far, the most referrals this relatively new blog has had so far come from the station’s own website, njn.net. Seems like folks are browsing the site and coming across the blog and checking it out at least. It’s nice to have a ready-made audience; or readership as I suppose they may call it here in blogdom. I have a buddy who shall remain nameless who writes a very popular political column here in the state and I shared these revelations with him the other day. I told him how I enjoyed looking at the stats to see how many folks are stopping by and reading. He says he won’t dare to look at his “hits” because he’s afraid what the numbers may show. I told him I thought he oughta because I think he’d be pleasantly surprised by how many people enjoy reading his particular brand of entertaining insight online in addition to the printed version. So why am I sharing these thoughts here now? Well it turns out the blog of yours truly, begun in late July, recently crossed the 1,000 visits threshhold. I liked seeing that figure because it’s a nice round number that’s got some heft to it for the relative newness of the enterprise. Sure, I’d love to see that many hits a week, a day, an hour even; as I’m sure many in this world do. So, no, it isn’t quite up to the level of, say, the New York Times Bestseller list or TMZ.com, but I’ll take it for now. And if you like what you’re reading, why then, be sure to tell a friend. And I’ll let ya know when we hit the next thousand mark milestone and beyond. Til then, you’re invited to keep on reading, and watching.